Descriptions and details of over 25 named scuba diving sites on the reefs and wrecks in the warm waters of St Kitts. Our all inclusive diving rates are the best value for diving in St Kitts. Wetsuits and dive computers included. Dive aboard our custom built 38ft dive boat. We set the standard for diver space and comfort. At all levels of instruction we teach using Dive computers and offer On Line eLearning for the educational content. Let us help you discover the underwater world around the beautiful island of St Kitts. After 36 years of scuba diving here in St Kitts we are still thrilled to be showing our divers the marine life. We are a family owned and run business and we take great care to offer you the best scuba diving experience on the island. Read our reviews on Tripadvisor and our guest comments. We offer a personal service and a fun atmosphere which enables you to get the most from your St Kitts scuba diving experience. All dives are led by a Padi Instructor who will give you a thorough dive briefing and accompany you on your dive. We are a Padi 5 Star Dive Resort and the only 5 Star Padi Dive Resort on the island of St Kitts. Why pay cruise excursion prices? Our dive shop is minutes away from the cruise ship terminal. We will collect and return you free of charge. Our all-inclusive rates are the best value on the island and your non diving partner is welcome on the dive boat. 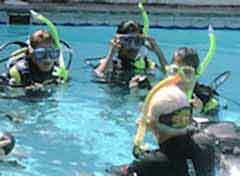 We also offer our Ocean Safety Diver course and referals to our cruise ship guests. Enjoy a Discover Scuba Diving Experience. Want to try Scuba diving in St Kitts without committing to a qualification course? Join one of our Padi Instructors for an underwater Discover Scuba Diving experience you will never forget! From Open Water to Divemaster, we offer the most comprehensive training on St Kitts. Speciality courses such as Ocean Safety, Wreck, Bouyancy, Photography, Deep etc are always available. Auston has been an Instructor for over 25 years and Our lead Instructor, Terry has over 1,000 Padi certifications over 10 years. Enjoy quality Scuba Diving Training with our Padi Master Instructor. Full details of our scuba diving training and courses available. We offer a Discover Scuba experience in the pool at the St Kitts Marriott resort every day of the week. After your pool experience you can join us for 2 ocean dives.. Details of our Marriott Discover Scuba program.